In 2001, Unilever dumped toxic mercury in the south Indian hill town of Kodaikanal, poisoning its workers and the forest. It took 15 years of campaigning and a rap song that went viral to force Unilever to settle with its workers. But the mercury-tainted factory site continues to leak the deadly neurotoxin into the environment and the forests nearby. And Unilever refuses to apply the same standards of clean-up for India that it would have to in Europe. This is environmental racism. Watch Sofia Ashraf, TM Krishna and Amrit Rao rallying against Unilever here. Sign the petition to tell Unilever CEO Paul Polman that Kodaikanal won’t put up with Unilever’s racism. But these have remained empty words. Seventeen years after the factory was shut down, the factory site remains as contaminated as ever leaking toxic mercury into the ecologically sensitive Pambar Shola. Worse, a trial remediation exercise undertaken by Unilever in November 2017 deployed a substandard process that would never have been allowed in Europe. The shoddy clean-up trials ended up mobilising more mercury into the environment than it recovered. For all its talk about caring for the environment, Unilever has not even brought the clean-up standard at par with the rest of the world. Here’s some more context: In the United Kingdom, where Unilever is headquartered, residential areas should not contain more than 1 mg of mercury per kilogram of soil. If Polman’s factory had been located in the UK, he would have had to clean up to at least that level. But in India, Unilever is trying to get away with a clean up that will leave 20 times more mercury in the soil than is considered safe for residential areas in the UK. Yup, environmental racism. Polman has been recognised as one of the “Champions of the Earth” by the United Nations. Kodaikanal and India are part of the same earth that UK and the Netherlands are part of. Let’s urge him to treat this contamination the way he would have to in Europe. My Polman, live true to your words that you will not put profits before people and the planet. Commit to a world-class clean-up that will leave behind no traces of mercury. 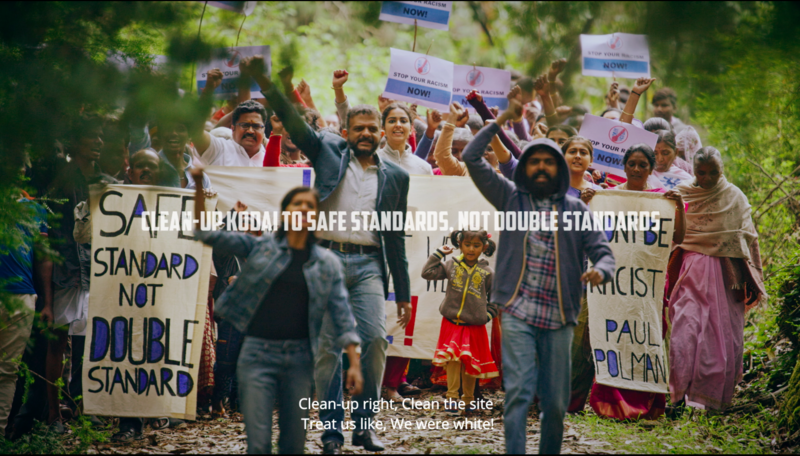 Kodaikanal won’t put up with Unilever’s racism!